The lawn mower, as with many inventions, was created to make work easier and time more efficient. In the 19th century, wealthy Europeans had some of the first lawns or trimmed grounds. These were cared for by grazing animals or servants using a scythe. The lawn mower was invented to help create a solution to having herds of animals on the grounds or large numbers of servants working with scythes. While the lawn mower has seen many improvements during its history, the basic design that started the concept is still in use today. The first true lawn mower was created in 1827 by Edwin Budding, a British inventor. 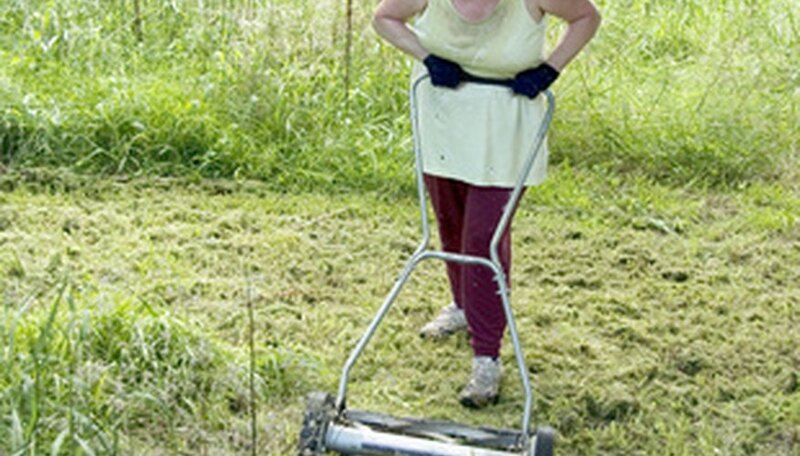 The lawn mower was created to replace the scythe on sports grounds and aristocratic gardens. It was patented in 1830. John Ferrebee became the first mass manufacturer of lawn mowers when he bought the rights from Budding in 1830. In 1842 another inventor, James Shanks, created a larger lawn mower similar to the Budding mower. Reel lawn mowers wwre the first type of lawn mower invented. These mowers are still in use today. A reel lawn mower has a horizontal cylinder of blades that rotates in the opposite direction of the wheels, acting as scissors cutting the grass. Rotary mowers are the lawn mowers with the blade face flat against the lawn under the mower deck. Rotary lawn mowers as we know them today began to develop in the 1860s; these early rotary lawn mowers resembled trays with a motor mounted on top with wheels. Rotary mowers didn’t arrive until the 1920s and 1930s when small powerful engines could be developed to move the blades at high speeds. The modern version of this mower arrived in 1952 under the Victa brand. Commercial lawn mowers actually predate household lawn mowers. The first lawn mowers invented were for large estates and sporting fields such as golf courses. Gang mowers have sets of blades and began manufacture in 1919 under the Worthington name. Worthington was purchased by Jacobson, which still uses the Worthington name on its gang mowers. The larger commercial mowers still use the reel lawn mower design while smaller commercial mowers have switched to the rotary mower design. Riding lawn mowers arrived after World War I; these first riding mowers used animal power to pull large mowing machines that the operator rode on. Today, riding mowers are much smaller and have a greater ability to turn including using a zero radius turn which allows the mower to turn while stopped. Modern riding mowers began being manufactured in the 1960s. The first chain-driven mower was created in 1859. The first steam-powered lawn mower followed in 1893 from James Sumner and used kerosene for fuel; these were followed soon after by gas-powered mowers which replaced the steam-driven mower. American manufacturers joined the British in making lawn mowers in 1870 with both countries having exports of lawn mowers by the 1890s. Electric mowers were first developed in the 1920s but didn’t take off until the 1950s when lighter designs and materials came onto the market.